"WNW" redirects here. For the US military radio protocol, see Wideband Networking Waveform. For the train company, see Southeastern (train operating company). For the journal, see Hastings West-Northwest Journal of Environmental Law and Policy. The points of the compass mark the divisions on a compass, which is primarily divided into the four cardinal directions: north, south, east, and west. These points are further subdivided by the addition of the four intercardinal (or ordinal) directions—northeast (NE), southeast (SE), southwest (SW), and northwest (NW)—to indicate the eight principal winds. In meteorological usage, further intermediate points between the cardinal and intercardinal directions, such as north-northeast (NNE) are added to give the sixteen points of a compass rose. At the most complete division are the full thirty-two points of the mariner's compass, which adds points such as north by east (NbE; sometimes NxE) between north and north-northeast, and northeast by north (NEbN; NExN) between north-northeast and northeast. A compass point allows reference to a specific course (or azimuth) in a colloquial fashion, without having to compute or remember degrees. The European nautical tradition retained the term "one point" to describe ​1⁄32 of a circle in such phrases as "two points to starboard". By the middle of the 18th century, the 32-point system was extended with half- and quarter-points to allow 128 directions to be differentiated. Several terms redirect here. For other uses, see Northeast (disambiguation), Northwest (disambiguation), Southeast (disambiguation) and Southwest (disambiguation). The four cardinal directions are north (N), east (E), south (S), west (W), at 90° angles on the compass rose. In Bulgarian, Catalan, Czech, Danish, Dutch, English, Esperanto, French, Galician, German, Greek, Hungarian, Ido, Japanese, Macedonian, Norwegian (Bokmal), Norwegian (Nynorsk), Polish, Portuguese, Romansch, Russian, Serbo-Croatian, Spanish, and Swedish, the part meaning north or south precedes the part meaning east or west. In Chinese and less commonly in Japanese, the part meaning east or west precedes the part meaning north or south. In Estonian, Finnish, and Telugu, the intercardinals use different words from the cardinals. The eight principal winds (or main winds) are the four cardinals and four intercardinals considered together, that is: N, NE, E, SE, S, SW, W, NW. Each principal wind is 45° from its two neighbours. The principal winds form the basic 8-wind compass rose. The eight half-winds are the direction points obtained by bisecting the angles between the principal winds. The half-winds are north-northeast (NNE), east-northeast (ENE), east-southeast (ESE), south-southeast (SSE), south-southwest (SSW), west-southwest (WSW), west-northwest (WNW) and north-northwest (NNW). The name of each half-wind is constructed by combining the names of the principal winds to either side, with the cardinal wind coming first and the intercardinal wind second. The eight principal winds and the eight half-winds together form the 16-wind compass rose, with each compass point at a ​22 1⁄2° angle from its two neighbours. 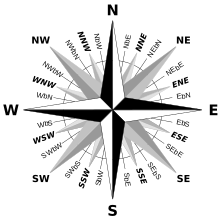 All of the points in the 16-wind compass rose (above) plus the sixteen quarter-winds (listed below) together form the 32-wind compass rose. The sixteen quarter-winds are the direction points obtained by bisecting the angles between the points on the 16-wind compass rose. The quarter-winds are: (in the first quadrant) north by east (NbE), northeast by north (NEbN), northeast by east (NEbE), and east by north (EbN); (in the second quadrant) east by south (EbS), southeast by east (SEbE), southeast by south (SEbS), and south by east (SbE); (in the third quadrant) south by west (SbW), southwest by south (SWbS), southwest by west (SWbW), and west by south (WbS); (in the fourth quadrant) west by north (WbN), northwest by west (NWbW), northwest by north (NWbN), and north by west (NbW). The name of a quarter-wind is "X by Y", where X is a principal wind and Y is a cardinal wind. As a mnemonic device, it is useful to think of "X by Y" as a shortcut for the phrase "one quarter-wind from X towards Y", where a "quarter" is ​11 1⁄4°, X is the nearest principal wind, and Y is the next (more distant) cardinal wind. So, for example, "northeast by east" means "one quarter from NE towards E", "southwest by south" means "one quarter from SW towards S", etc. In summary, the 32-wind compass rose is yielded from the eight principal winds, eight half-winds and sixteen quarter-winds combined together, with each compass direction point at an ​11 1⁄4° angle from the next. 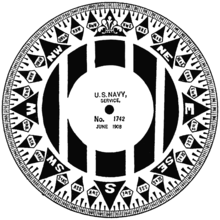 In the mariner's exercise of boxing the compass, all thirty-two points of the compass are named in clockwise order. The traditional compass rose of eight winds (and its 16-wind and 32-wind derivatives) was invented by seafarers in the Mediterranean Sea during the Middle Ages (with no obvious connection to the twelve classical compass winds of the ancient Greeks and Romans). The traditional mariner's wind names were expressed in Italian, or more precisely, the Italianate Mediterranean lingua franca common among sailors in the 13th and 14th centuries, which was principally composed of Genoese (Ligurian), mixed with Venetian, Sicilian, Provençal, Catalan, Greek and Arabic terms from around the Mediterranean basin. Local spelling variations are far more numerous than listed, e.g. Tramutana, Gregale, Grecho, Sirocco, Xaloc, Lebeg, Libezo, Leveche, Mezzodi, Migjorn, Magistro, Mestre, etc. Traditional compass roses will typically have the initials T, G, L, S, O, L, P, and M on the main points. 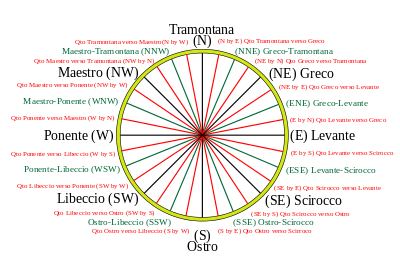 Portolan charts also colour-coded the compass winds: black for the eight principal winds, green for the eight half-winds, and red for the sixteen quarter-winds. Each half-wind name is simply a combination of the two principal winds that it bisects, with the shortest name usually placed first, for example: NNE is "Greco-Tramontana"; ENE is "Greco-Levante"; SSE is "Ostro-Scirocco", etc. The quarter winds are expressed with an Italian phrase, "Quarto di X verso Y" (pronounced [ˈkwarto di X ˈvɛrso Y] one quarter from X towards Y), or "X al Y" (X to Y) or "X per Y" (X by Y). There are no irregularities to trip over; the closest principal wind always comes first, the more distant one second, for example: north-by-east is "Quarto di Tramontana verso Greco"; and northeast-by-north is "Quarto di Greco verso Tramontana". The table below shows how the 32 compass points are named. Each point has an angular range of 11.250 degrees where: middle azimuth is the horizontal angular direction (from north) of the given compass bearing; minimum is the lower angular limit of the compass point; and maximum is the upper angular limit of the compass point. Compass roses very rarely named the fractional points and only showed small, unlabelled markers as a guide for helmsmen. The table below shows how each of the 128 directions are named. The first two columns give the number of points and degrees clockwise from north. The third gives the equivalent bearing to the nearest degree from north or south towards east or west. The "CW" column gives the fractional-point bearings increasing in the clockwise direction and "CCW" counterclockwise. The final three columns show three common naming conventions: No "by" avoids the use of "by" with fractional points; "USN" is the system used by the US Navy; and "RN" is the Royal Navy system. Colour coding shows whether each of the three naming systems matches the "CW" or "CCW" column. ^ David Boardman. Graphicacy and Geography Teaching, 1983. Page 41 "In particular they should learn that wind direction is always stated as the direction from which, and not to which, the wind is blowing. Once children have grasped these eight points they can learn the full sixteen points of the compass." ^ a b E. Chambers Cyclopaedia: or, an Universal Dictionary of Arts and Science, 5th Ed, 1743, pp. 206–7, "Points of the Compass, or Horizon, &c., in Geography and Navigation, are the points of division when the whole circle, quite around, is divided into 32 equal parts. These points are therefore at the distance of the 32d part of the circult, or 11° 15′, from each other; hence 5° 37 1/2′ is the distance of the half points and 2° 48 3/4′ is the distance of the quarter points. ^ Webb Aintablian, Xanthe (28 June 2018). "An Overview and History of the Compass". thoughtco.com. Dotdash. Archived from the original on 6 July 2018. ^ Lee, Robert E. (2011). "Compass Rose". University of Washington. Archived from the original on 21 February 2015. ^ George Payn Quackenbos A Natural Philosophy: Embracing the Most Recent Discoveries 1860 "Mentioning the mariner's compass: the points of the compass in their order is called boxing the compass. — The compass box is suspended within a larger box by means of two brass hoops, or gimbals as they are called, supported at opposite ..."
^ Bowditch, Nathaniel (1916). American Practical Navigator: An Epitome of Navigation and Nautical Astronomy. United States Hydrographic Office. p. 15. ^ Kemp, Peter, ed. (1988). "Box the Compass". The Oxford Companion to Ships and the Sea. Oxford University Press. p. 103. ISBN 0-19-282084-2. Wind Rose (archived) – discusses the origins of the names for compass directions.